Yes, I know… the name is terrible. I’m not sure one should actually use the word “poo” when naming their diaper design, but I’m also equally convinced that super-cutesy names aren’t necessarily the way to go. But I digress, as this is supposed to be a pattern review. I cloth diapered all three of my children, but it wasn’t until very late in the game while diapering #2 and #3 (twins) that I ventured into making any diapers of my own. It’s surprisingly easy. I am a pattern sewer by nature, so I went looking for patterns. There are many free ones out there, and some inexpensive ones with PDF downloads. But I wanted a real, printed, pattern, so I tried the Side-Snapping Poo Pockets pattern. Of all of the diaper patterns I’ve tried, it’s by far my favorite. As you can hopefully see, the pattern is a sized diaper and requires snaps. I have a snap press, but you could use less expensive snap pliers as well. 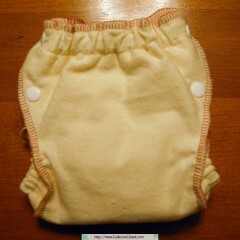 The pattern has a sewn in absorbent center, which gives the finished diaper 5 layers of fabric through the center. You can then use a doubler if needed for extra absorbency. 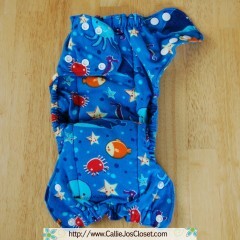 And these diapers require a cover, since they do not have a waterproof outer layer. If you’re going to make this one with a serger, you need to disengage the cutting blades, and if you haven’t done curves before, practice, practice, practice before you try on your diaper! Trust me, ripping the serging from around the entire diaper is no fun. Overall, I LOVE this pattern. It’s affordable, a great pattern with instructions for both beginner and advanced sewers and the results are perfect. The main caveat is that you cannot sell product made from this pattern. 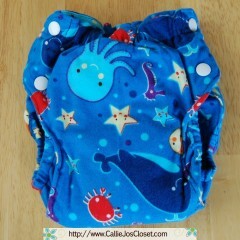 The owner, when contacted, said that it takes away from her sales, though I didn’t see any of this style diaper for sale at her web site. Furthermore, I think allowing others to sell her diaper would only help with her brand awareness, because let’s face it… who here has ever heard of “Poo Pockets” before now? I only heard of them after searching the web for sewing patterns, and I was very active in parenting and cloth diapering message boards and had never heard of this brand. At any rate, it’s a great pattern and a great diaper! Give it a try!